The museum is located at the historic Caperton Station in Martinsburg, WV. Parking is available onsite and is free on Saturdays and Sundays. 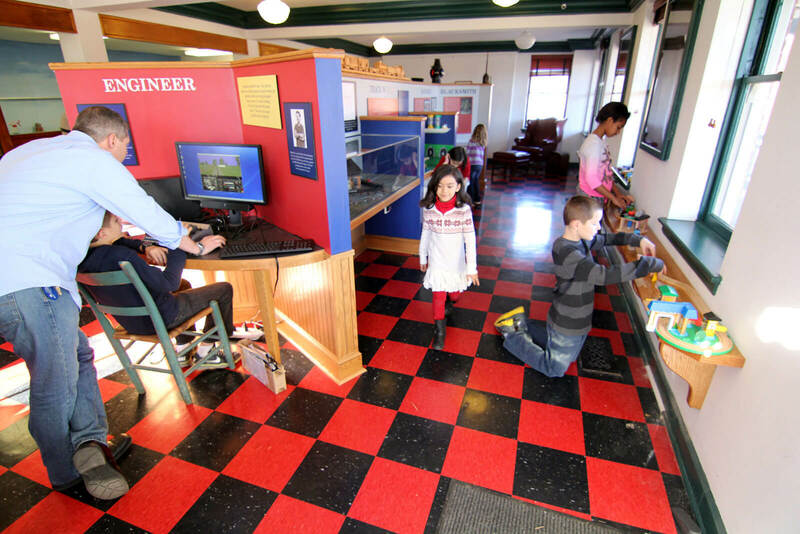 For The Kids, By George Children's Museum is also conveniently located in downtown Martinsburg near the Martinsburg-Berkeley County Convention and Visitors' Bureau, other historic sites and attractions, shopping and restaurants within walking distance. Martinsburg Station is a railway station in Martinsburg, West Virginia, United States, served by Amtrak and MARC. The station also included the historic Baltimore and Ohio Railroad roundhouse, and Martinsburg Shops. Located on the mainline of CSX, Martinsburg Station sits among the city's many cultural and historic destinations. The station is a restored 1848-1876 railroad hotel and its sympathetic modern train station addition at 229 East Martin Street in Martinsburg. It is also a contributing property to the Baltimore and Ohio and Related Industries Historic District. The station has seen many events historic to Berkeley County and the nation. In 1863, the hotel witnessed the destruction of the B&O Roundhouses and shops by General Stonewall Jackson and was also the site of the first national labor strike. Martinsburg Station is the portal to the state's first Civil War Trail (the Antietam Campaign) and the Gettysburg Campaign: General Robert E. Lee's army retreated through Martinsburg two blocks west following the "high-water mark of the Confederacy."